Institute's Michael McCrudden scored a brace. Institute booked their place in the Tennent’s Irish Cup last 16 following a deserved win at Ballyclare Comrades. Despite letting slip a two goal lead, the Waterside men in the end saw off a spirted Comrades side thanks to both Michael McCrudden and Stephen Curry helping themselves to a brace each. Kevin Deery gave a debut to new signing Sammy Morrow, while Niall Grace also started. However despite the sickness in the camp it was the visitors who took the lead on three minutes. A miss hit back-pass by Mark Shannon was latched onto by Stephen Curry, his cut-back found Grace, his effort was blocked but Michael McCrudden’s follow up effort found Paddy Flood’s bottom right hand corner. Institute doubled their lead seven minutes later as Grace fed Stephen Curry down the right, he cut inside past Shannon, before drilling the ball home past Comrades keeper Flood. The home side pulled one back in fortunate circumstances on as Samuel McIlveen’s 25 yard free-kick took a deflection off Aaron Harkin, who was in the Stute wall, and it caught out goalkeeper Marty Gallagher. Minutes later Comrades striker Chris Trussell got in behind the Stute defence and skipped around the out-rushing Gallagher, but his shot from a tight angle was cleared off the line by Darryl McDermott. Comrades levelled things on 32 minutes from the penalty spot as Gary Brown was brought down just inside the box by McDermott and Corey McMullan made no mistake with the resulting spot-kick. Right on the stroke of half-time Institute missed a glorious chance to regain the lead but Curry blasted over from just inside the box, after Morrow’s inch perfect lay-off had created the clear-cut opening. Deep into stopage time in the first half Curry again had a super opportunity as the ball fell to him following a 50/50 challenge but he couldn’t get the ball under control and by the time he did his close range strike was blocked by Dean Youle. Comrades started the second half on the front foot and they went close on a few occasions but their final ball let them down and Gallagher did well to save McMullan’s stinging drive. 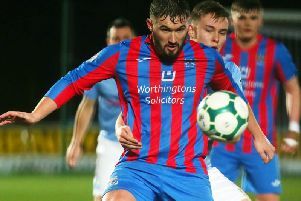 Institute should have netted a third on 56 minutes as Aaron Harkin’s pass found Stephen O’Donnell, but the skipper dragged his shot from 14 yards wide when only having Flood to beat. Institute did take the lead on 65 minutes as a sublime pass by Grace found Curry, his first touch was superb, and the winger fired the ball home from just inside the box. Minutes later Morrow should have marked his debut with a goal but he dragged his shot wide from an acute angle, after Curry had played the striker in down the right side of the penalty box. McCrudden should have added a fourth on 73 minutes when he broke the offside trap but his tame attempted lob over Flood was easily gathered by the keeper. On 83 minutes McCrudden made up for that miss as he made no mistake clipping the ball home past an out-rushing Flood, after Morrow’s clever black-flick had put the midfielder through on goal. Right at the death substitute’s Ryan Doherty should have scored but Flood’s big right hand kept the midfielder’s close range effort out. Ballyclare Comrades: Flood, Woods, Shannon (Hill 65), McMullan, Johnston, Youle, O’Hanlon, McIlveen, Trussell, Brown, Robinson. Institute: Gallagher, Roddy, McDermott, Scoltock, D Curry (Brown 79); Grace, O’Donnell, A Harkin; S Curry (Brown 79), Morrow, McCrudden (Doherty 86).